Well, I fugured that I should at least post a doodle along with my first entry. 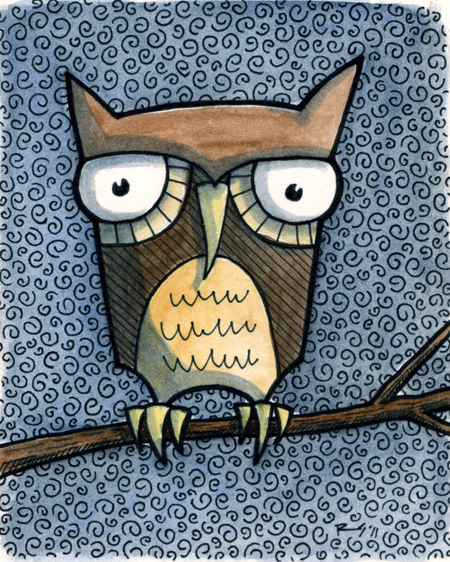 This owl will eventually be for sale, in print form, at Etsy very soon. I first designed this owl at my inlaws kitchen table around 1:30am. It was part of my graduate project. Having two kids is delaying all things that require time so you will see the words "coming soon" in most of my sentences. As for my kids, my son can be credited for the title of the blog....angry strongo. This is a character name that he created out-of-the-blue one day. My wife and I love the name and will be posting pictures of what we think this guy/thing/animal looks like. I will soon be designing a header for this blog as well. I hope this blog is enjoyable text along with unique drawings and such. If i can be of any artistic help to anyone out there, please email me and let me know and we can "start a dialogue"....my least favorite phrase. Stop back often and enjoy!